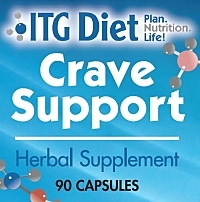 Crave Support uses botanical extracts to support two areas of human physiology that help regulate control of body weight: the central nervous system and the peripheral energy-generating systems. These share some of the same neurotransmitters, dopamine and noradrenaline (norepinephrine) and can thus be supported simultaneously and beneficially in terms of assisting weight loss. Thermogenesis and craving/satiety support in one product. Directions: Take one capsule up to three times a day with an 8oz glass of water preferably 30 minutes prior to meals. Commence with a low dose and build up to the most comfortable dosage level. Not to exceed 3 capsules in a 24 hour period. NOT FOR SALE TO, OR USE BY, PERSONS UNDER THE AGE OF 18. KEEP OUT OF THE REACH OF CHILDREN! STORE AT ROOM TEMPERATURE (59°F - 86°F) IN A DRY PLACE AND KEEP TIGHTLY CLOSED. AVOID DRIVING OR OPERATING MACHINERY DRIVING UNTIL YOU KNOW HOW THIS PRODUCT AFFECTS YOU! Seek advice from a health care practitioner prior to use if you are pregnant or nursing, or if you have high blood pressure, heart or thyroid disease, diabetes, difficulty in urination due to prostate enlargement, or if you are taking prescription drugs. Do not take this product if you are taking appetite suppressants or products containing ephedrine or pseudoephedrine, or are taking an MAO inhibitor, or have taken an MAO inhibitor within the last 3 weeks. Reduce or discontinue use if nervousness, tremor, sleeplessness, severe loss of appetite, euphoria, nausea or constipation occur. Read more...for more detailed information about this product.